I dressed up this year. I couldn't help but want a Krispy Kreme donut after that. They sell 'em in grocery stores up here, but of course those have been packaged and are who-knows-how-old. And when I googled I saw there is a Krispy Kreme shop just 27.5 miles from my house. So off I went, on a donut-fetching adventure. All the more fun for its preposterousness, extremity, and anti-thrift. As luck would have it, as I arrived, the hot donuts were only about 4 minutes from ready. People were watching through the plexiglass as the almost-donuts floated along the grease river to the glaze waterfall. So I got not just Krispy Kreme but hot, fresh Krispy Kreme! Mmmmm. Also, over by the napkins, there was a pile of paper Krispy Kreme hats, just there for the taking, for anyone. So I took one. 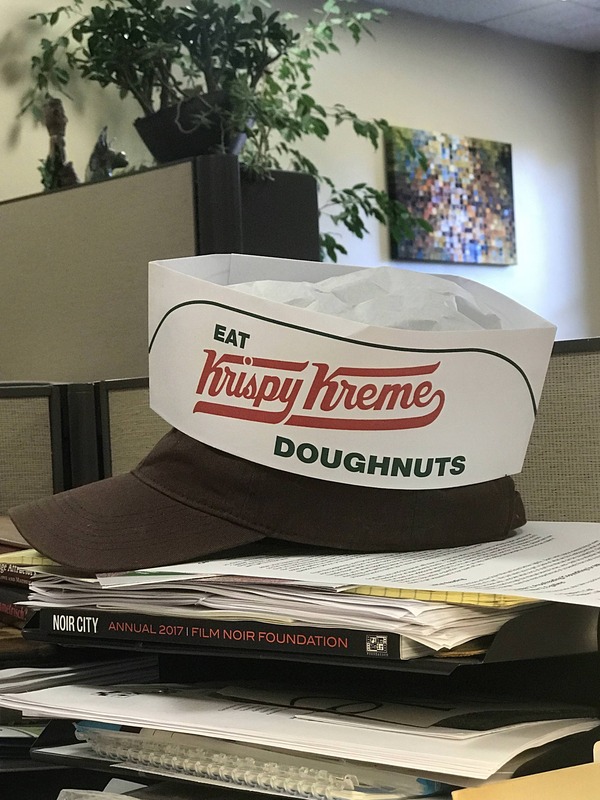 When I went out to the car to have my first-ever HOT Krispy Kreme donut, I figured I'd put the hat on while I ate it, just to complete the whimsy. Thing was, though, a guy leaving at the same time as me held the door for me and then went to his car, right next to my Jeep. And he wasn't in any hurry to drive away either. And he had dark tinted windows, so I couldn't tell if he was looking at me. So I had a brief hesitation about the hat thing, on accounta that. But I'm proud to say I put it on anyway. And here's the nametag I made, along with part of my apron & the bow tie that I'd lost in the house (but recently found & knew I had cuz I wore it to some chorus show and saw a picture of me in it later), making this Bow Tie Wednesday. Convincing enough, for a work costume. Nah, the Krispy Kreme workers don't wear that Ikea apron. I didn't lay in any candy for kids. I don't generally get trick-or-treaters. It always feels like I'm running a chance of getting egged or something, but the greater chance is that I'll have a bunch of candy I don't want, when there'll already be surplus candy people are trying to get rid of in the following days.